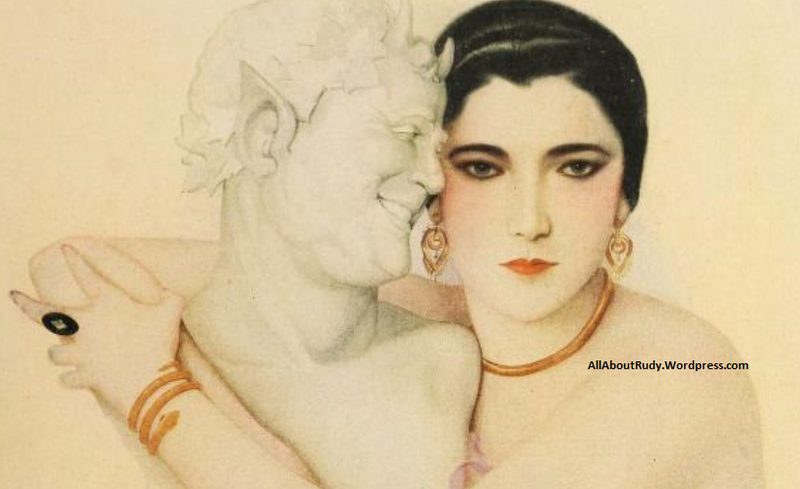 The original theme of Martin Brown’s Play, “Cobra,” having been written for a woman star, obviously puzzled the picture-makers in their efforts to twist it into a virile vehicle for Rudolph Valentino. Therefore, this main idea receives but scant attention in the screen version, the narrative of which, as it is unfurled, is moderately entertaining until the director and his henchmen decide to include a fang or two of the poisonous reptile. It then becomes quite absurd and the accompanying captions assist in the general decline.Nita Naldi is supposed to officiate in the title rôle, but she is not called upon to appear until the story is well on its way. It is soon after her entrance that the real theme is attacked, the adapter having endeavored to shift the importance of the character from Elsie Van Zlla to Count Rodrigo Torriani, which results in the distressing consequences.Torriani, played by Mr. Valentino, is painted as a happy-go-lucky nobleman who finds any pair of feminine eyes enchanting. One might infer that he is sowing wild oats with a vengeance, as he is constantly discovering himself to be infatated with some new fascinating creature. He has only to shake their hands, look into their eyes, and the wicked work is started. One of these charming young women happens to be Mary Drake, a stenographer, who is declared to be sweet and innocent, and is an inspiration to the Count to cause him to mend his ways. This good girl is an artist with paint and powder. Her lips are like cherries and her eyes are liberally outlined with mascara. Yet she is declared to be so serious in her attentions that one would expect her to shy at the sight of a lipstick. The Count falls in love with this Mary, but he cannot resist Elsie’s black eyes, even though she is wedded to his fast friend, Jack Dorning; and this brings about trouble. Elsie is burned to death in a hotel fire and Doming eventually learns of the Count’s conduct. So as to ingratiate the Count in the eyes of the spectators, the scenarist has him make a sacrifice. He insists to Mary that he is just as bad as ever, and the consequence is that she marries Doming. So in this little tale Dorning has two wives, but the Count remains a bachelor. Mr. Valentino takes advantage of the opportunity to wear a variety of clothes. In one sequence he is seen as the Count’s seventeenth century ancestor. After that he wears golf clothes, lounge suits, white flannel trousers with a blue coat, white shoes with a blue suit, and when he dines alone he is so punctilious that he appears in full evening dress. In one sub-title the Count is alluded to as an “indoor sheik,” and the fight that follows gives Valentino credit for a Firpo blow, while his opponent must have a cast-iron jaw.Casson Ferguson, who officiated as the villain in the film version of “Grumpy.” and recently was seen in a similar part in “The Road to Yesterday.” in this current feature fills the sympathetic rôle of Doming in a somewhat stereotyped fashion. Miss Naldi, whose eyes match Sir. Valentino’s, makes the best of a bad bargain. Mr. Valentino’s acting is acceptable, but he is not indifferent to his much exploited looks. Hero Remains a Bachelor. “A new public bathroom was opened on the North Side a few days ago, a truly handsome place and apparently well run. The pleasant impression lasts until one steps into the mens washrooom and finds there on the wall a contraption of glass tubes, and levers and a slot for the insertion of a coin. the glass tubes contain a fluffy pink solid and beneath them one reads an amazing legend which runs something like this Hold personal puff beneath this tube and then pull the lever. ” A powder puff vending machine! In a mens washroom! Homo Americanus! 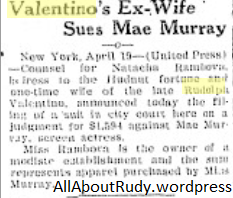 Why did someone quietly drown Rudolph Valentino alias Valentino years ago? “And it was the pink powder machine pulled from the wall or ignored? It was not. It was used. We personally saw ‘two men’ as a young lady contributor to the voice of the people is wont to describve the breed step up – insert coin, hold kerchief beneath the spout, pull the lever then take the pretty pink stuff and pet it on their cheeks in front of the mirror. “Another memeber of this department one of the most benevolent upon the earth, burst raging into the office the other day becuase he had seen a young man combing and pomenading his hair in a elevator. but we claim our pink powder story beats his all hollow. It is time for a matriarchy if the male of the species allows such things to persist. Better a rule by masculine women than by effemoinate men. Man began to slip we are beginning to believe when he discarded the strtaight razor for the safety pattern. We shall not be surprised when we hear that the safety razor has given way to the depthatory. collar on his overcoat. Great guns, what a man. And the wrises watch worn on a slave bracelet? It gives us a horrible sinking feeling at the pit of the stomach to know that within the next few days tailors and clothing stores will be swamped with requests for green suits, think overcoat buyers will demand beavor collars, tha jewelers will be besought for slave bracelets whatever they are Just like Valentinos. Sadly we acknowledge ourselves that this will happen. “Rudy says he tried to make his wife happy. But a man with my particular temperament being very suspectible to any kind of beauty, whether in feminity or art really hasnt any business with a wife. There always is that feeling of disatisfaction; that consciousness of the women in the background.” As they say in vaudeville and they shot Lincoln. “Rudy doesn’t like marriage because it cramps his style. He says there is too much fun to be found afield to be tied down by the conventions of monogamy. Rudy is a strayer, is this lover of things beautiful? Blood will tell. Heredity and early environment do mold the individual. Green suit, beaver collar, slave bracelet adorning this Don Juan. whos too self-important, too bent on gratifying his fancies, to fancy marriage. Rudys nothing more than a spaghetti-gurgling garnders helper, product of modern feminishm, and all the wishy-washy feminine gurgling in the work cant change him. Thank god for five-yard McCarty. After seeing “The Sainted Devil” I wish to express sincerest appreciation for the acting of “Rudy” and “Nita”. The only thing I didn’t like was the way it dragged in several places, and I am sure no woman was ever as big a fool as Dona Florencia. No matter what the critics may say about this actor we know that he has accomplished good work and if given a fair chance will continue to do so. No one can see his pictures, any of them, and then come away and say he isn’t a good actor. Why do they pick on him? Seemingly, someone is always hounding him. Some people are too lazy to use their common sense and count their calories. Here is a diet and its easy, too once you get trained to it. Eat plenty of fresh green vegetables and plenty of salads. A question was asked about dressing for salads and vegetables. Nita replied if you cook vegetables properly, you don’t need cream or butter to make them taste right. Nor do you need rich Hollandaise and Mayonnaise. You can make a good salad dressing without olive oil. Fix it up with mustard, paprika and Worcestershire sauce. Vance Thompson gives soft mutton jelly as a substitute for olive oil. Olive Oil just one tablespoon contains 1000 calories. Of course you can’t get away from calories entirely. A glass of orange juice contains about 100 calories. Women who are reducing ought to stay under a1000 calories a day and women who are trying to fatten up can go up to 1000 calories and more. Vegetables are the safest for reducing. You can eat nearly all of them and, besides its good for you. You can eat asparagus, cabbage, tomatoes, celery, spinach, string beans, beets, peas and artichoke. I suppose, just to be contrary, after that nice list most women will insist on having corn on the cob. But corn is taboo. White bread is bad, and potatoes are dreadful. And sugar in any form is just a pound a spoonful. I drink ice tea without any sweetening but plenty of lemon. I really like it better without sugar or saccharine. As a matter of fact, successful dieting means good cooking. And good cooking does not mean rich cream foods nor greasy fried foods. It means plenty of variety and good taste. It doesn’t mean every mean should be a Thanksgiving dinner or that you ought to sit down and eat as though you were never going to see food again. A light luncheon is not only good for keeping thin it’s good for your general health, unless your underweight. And eating between meals is a bad habit for anybody. Too much exercise is worse than none at all, if your trying to reduce. A little is all right, just to keep in trim, but don’t overdo. Women who exercise to get thin only harden the muscles and when the fat creeps on again, there lost. They never get it off. 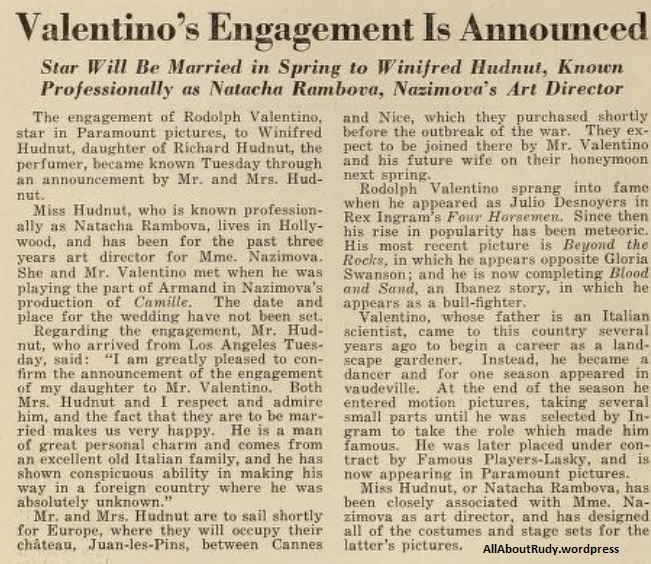 Verily, Natacha Rambova seems to be the Patsy of the motion picture business of late. The papers leaped at the story which the gallant Rudy pulled as the cause of the separation which, by the time this appears, will have developed into a Parisian divorce decree. Natacha, he says, is not a home body. She didn’t want children. She would not cook the spaghetti. She was fond of dogs. She wanted to work. His reflected glory did not satisfy her. She wanted her own career. Bunk! Bunk served with piffle sauce. Great publicity for Rudy. But old stuff. Do you remember the way Gloria Swanson set the dear old souls of Paris wild overheard when she said she wanted five or six children? I believe she meant it, because I have seen her with her two children. She adores them. But I have heard of Mr. Valentino hanging around an orphan asylum, and I cannot quite visualize the picture of the sheik walking the floor of a cold California night crooning to Junior asleep. It was not, in my opinion, playing the game to make an effort for sympathy and publicity at the expense of the woman even if it were true which I doubt. And we must hand Mrs. Valentino credit for her attitude in the whole matter. She would not live with him and his friends, told him so, get out, leaving her belongings to him, and went on her way, avoiding any opportunity to publicize herself at his expense. Divorce is no joking matter, but I cannot hold back a little snicker at Rudy crying on the shoulders of the public yearning for kiddies. There is nothing vindictive or downright mean about Valentino. He’s a pleasant chap and a fine actor, whose delusion is that he is also a business man. Natacha has been criticized for managing his affairs. But we have got to admit that in this case her management was much more commendable than his. And to add to her troubles, the F.B.O Company, for whom Miss Rambova made a picture because she needed the money changed its name to “when love grows cold” after it was finished, with the frank purpose of capitalizing her marital troubles. Miss Rambova protested that it would harm her and create the impression that she was the one who was profiting by deceiving the public into believing it was a screen revelation of their love wreck. I am a Swedish Valentino fan. 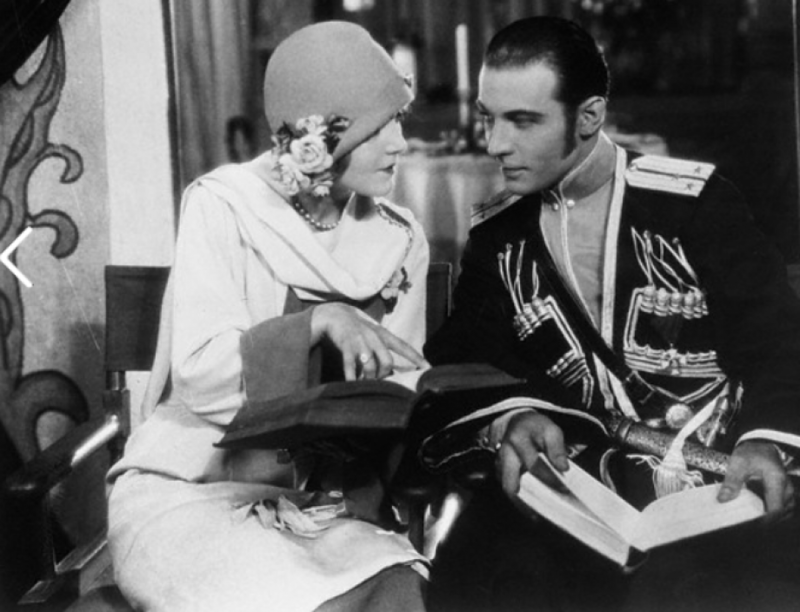 I will tell you that in Europe Rudolph Valentino is the most popular of all the American film stars. John Gilbert and Ramon Navarro are not so poular as Valentino. Here in Sweden all the girls love Valentino and we now anxiously await his next picture “Monsieur Beaucaire” was a wonderful picture and so was “A Sainted Devil”. I wish he will dance in all his pictures. George Glenbrook, Nevada writes Rudolph Valentino does spell his name Rodolpho but everybody seems to prefer Rudolph. So that’s that.